What's life without a little sparkle...or a lot of it? 1. 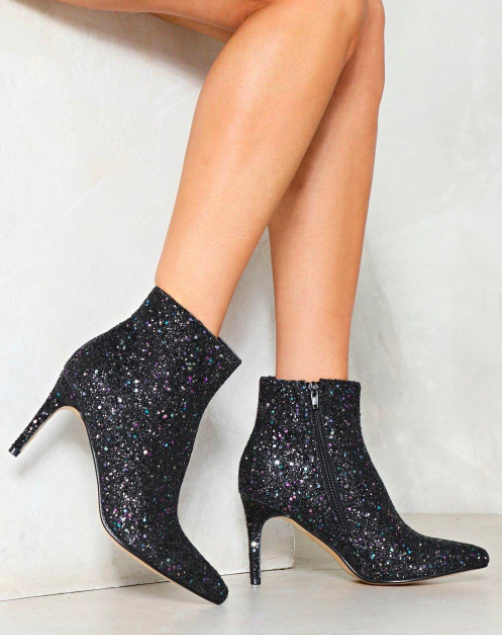 Sparkly booties made for stomping the haters. Get the pink for $36 (available in sizes 5-8) or the black for $64 (available in sizes 5-8), both from Nasty Gal. 2. A pair of drinking glasses overflowing with pizazz. Get them from Macy's for $28. 3. A mermaid blanket that desperately needs to be part of your world. Brush your flippers over the reversible sequins to turn the tail silver. Get it from Nasty Gal for $40. 4. A necklace sure to have you crying out with joy. Get it from RockCakes on Etsy for $7 (available in five colors). 5. Fenty Beauty Match Stix for getting your glow on. These shiny makeup sticks (designed by Rihanna, the woman who once wore nothing but crystals and should therefore be everyone's role model) can be used as blush, bronzer, highlighter, or in a zillion other ways. And one of the colors is a glittery purple called unicorn, because you'll feel like a legendary beast in this stuff. Get it from Sephora for $25 (available in 10 colors). 6. A pair of leggings that are a walking party. The opposite side is a black, faux-leather panel, so I like to call these babies a reverse mullet: business in the back, party in the front. Get them from Amazon for $12.48+ (available in sizes S-XXL and nine colors). 7. And a flashy flask to bring to said party. 8. A clutch describing what you do on the daily. Get it from Express for $17.45. 9. 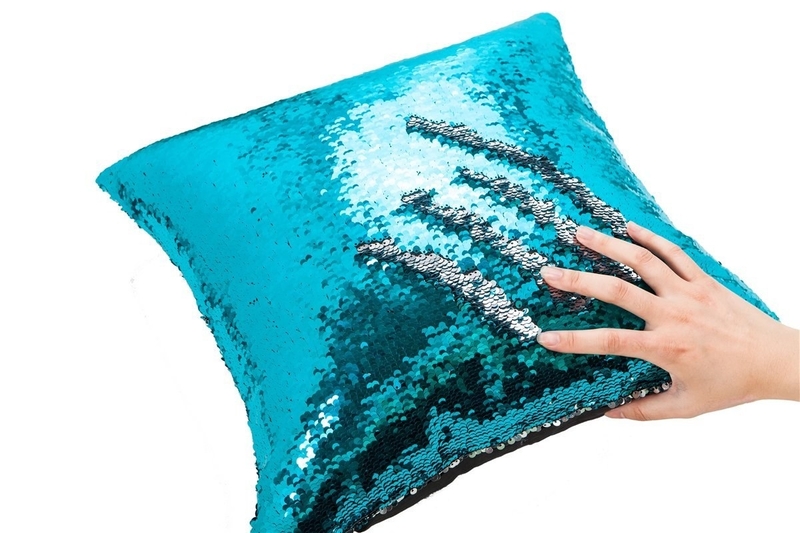 A pillowcase that lets you create art in sequin form. The sequins are one color on one side and a different color on the other, so you can flip 'em over to create cool designs, then wipe it away and do it again. Get it from Amazon for $8.98+ (available in 14 color combinations). 10. Little body glitter gels to deck yourself out in glitz. Get them from Boohoo for $10. 11. 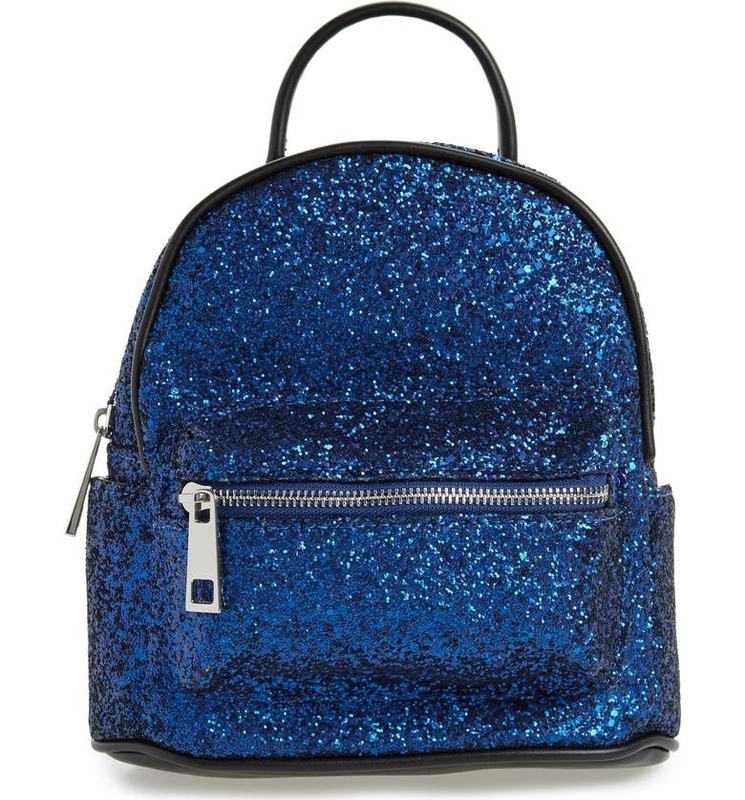 A mini backpack that's big on style. Get it from Nordstrom for $27.49 (available in two colors). 12. A dress for a better sequins of events in 2018. This fabulous number is from Tracee Ellis Ross's quirky line for JCPenney. The sequins are reversible, so it can go from gold to an LBD. Get it from JCPenney for $74 (available in sizes S-XL here or 1X-3X here). 13. Wonderfully mismatched earrings that will be the stars of the show. Get them from Amazon or Macy's for $32. 14. A jazzy jacket just begging to be paired with black. Get it from Nasty Gal for $140 (available in sizes XS-L). 15. Flashy flats for when you need to get straight to the point. That point being that sparkle is appropriate to wear every damn day. Get them from Forever 21 for $9.95 (available in sizes 5.5-10 and in two colors). 16. A skirt built to dance in, since it serves as your own personal disco ball. Get it from Forever 21 for $22.90 (available in sizes S-L and in two colors). 17. 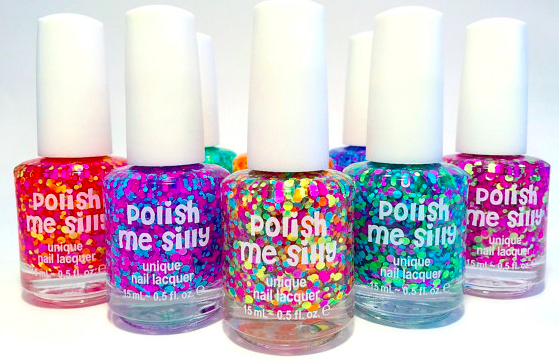 A make-your-own polish kit that totally nails it. Each kit includes a packet of glitter, clear top coat, a funnel, a spoon, a stirring stick, and directions. The finished product will add an extra layer of fabulousness to any mani. Get it from PolishMeSilly on Etsy for $9.75 (available in 15 colors). 18. A magical unicorn who dispenses tape but also joy. The tape is glittery too, of course. Get it from H&M for $6.99 (available in two colors). 19. Cat-eye sunglasses that'll have everyone but you blinded by their light. Get them from Free People for $30 (available in two colors). 20. 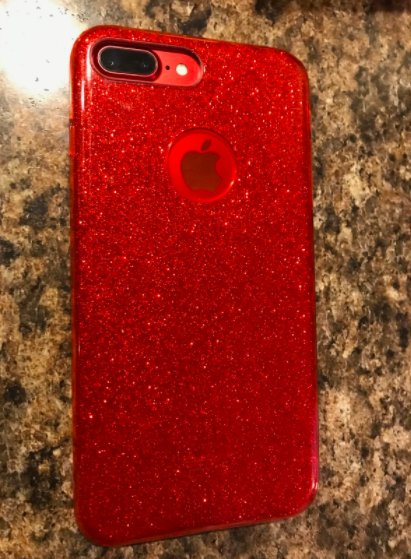 A high-gloss phone case in a Dorothy-worthy red or a snazzy ombre. 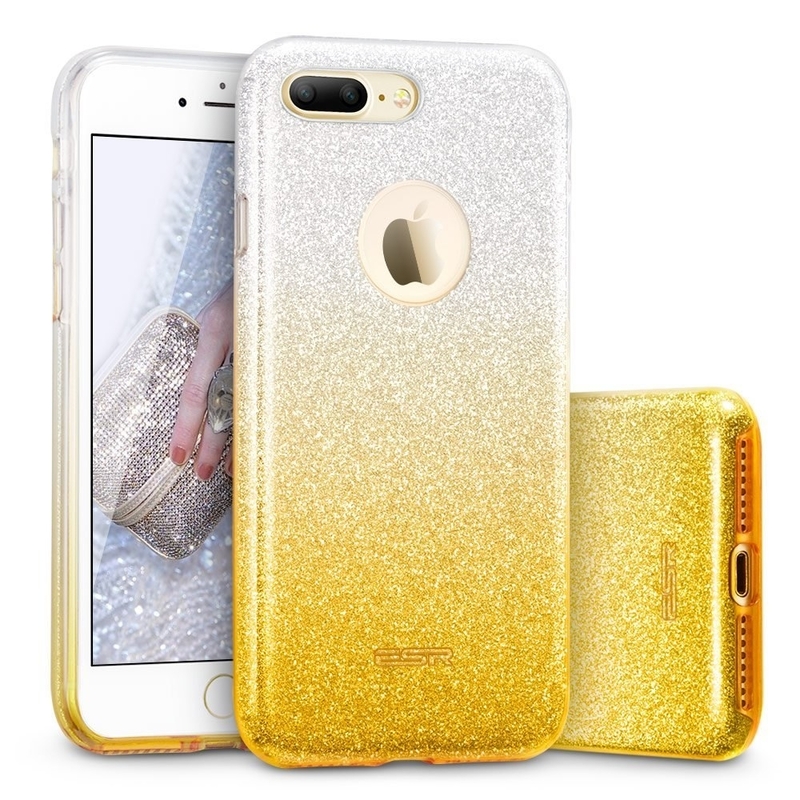 They're made up of three layers — the glitter coating is sandwiched between two pieces of durable plastic, one drop-resistant and one scratch-resistant — so they're super sturdy. Get it from Amazon for $11.99 (available in ten colors). 21. A baseball cap for those of us who consider style a sport. Get it from Boohoo for $6. 22. A set of bangles to have you looking totally bangin'. Get them from Amazon for $8.95 (available in 21 styles). 23. Dazzling tights so you'll have a leg up in the new year. 24. Hi-top sneakers if you're into fancy footwork. Get them from Free People for $75 (available in sizes 6-10). 25. 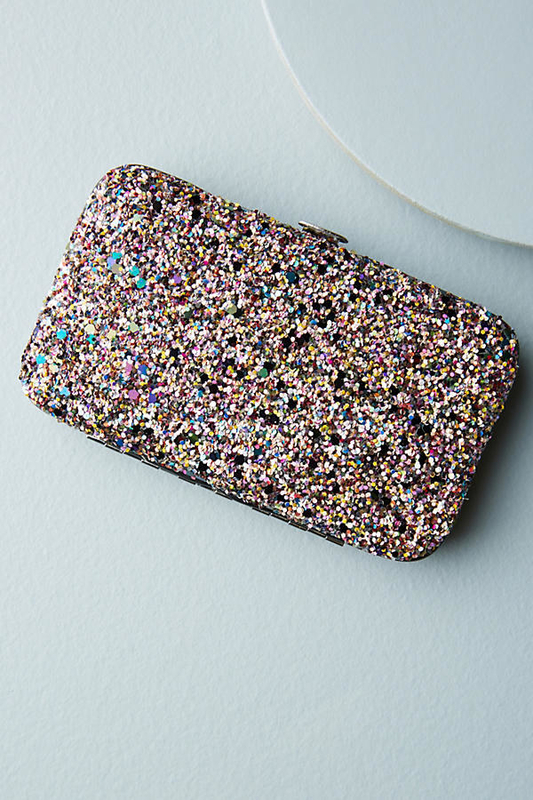 A clutch you'll wanna cling to like it's made of an IRL precious metal. 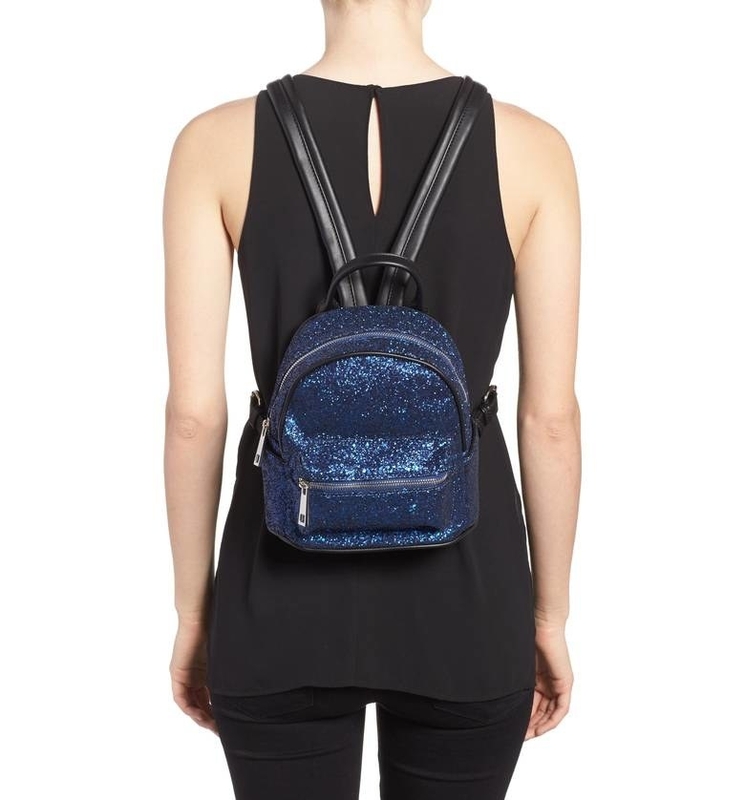 It also has an optional crossbody strap for when you need you to throw your hands up in the air like you just don't care. Get it from Francesca's for $38. 26. A corgi notebook that gleams, no butts about it. 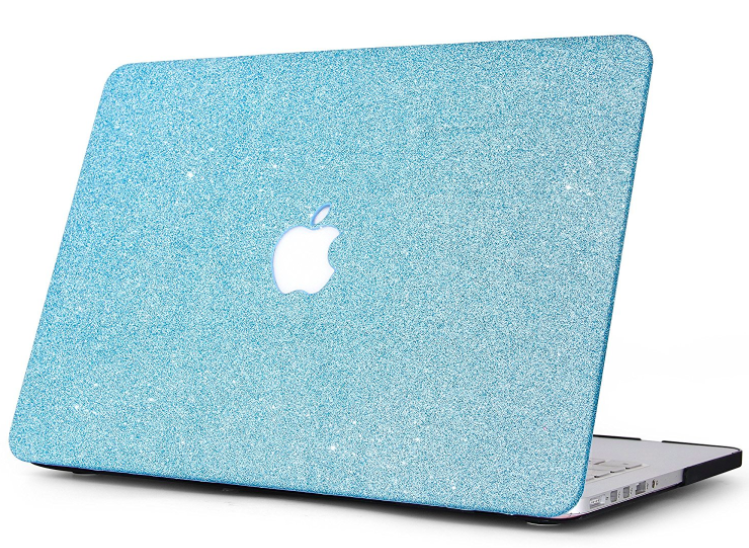 The sparkle is actually a print, not real glitter, but it's totally convincing and way less messy. Get it from Red Wyvern Designs on Zazzle for $16.25 (available in three styles, eight paper types, and five spiral colors). 27. And some glittertastic gel pens to write in it with. Get a set of 24 from Amazon for $14.95. 28. 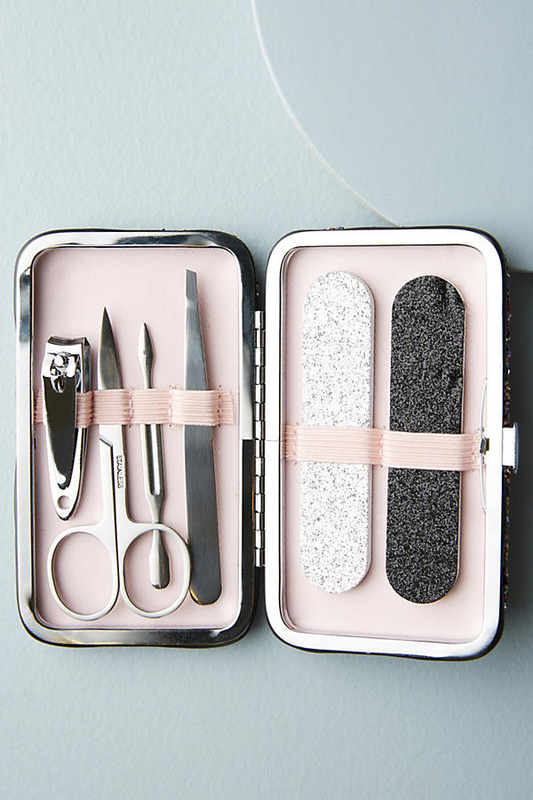 A confetti-inspired manicure kit that deserves to be filed under "must have." 29. A totally tubular velvet and sequined scrunchie for the hottest of buns. 30. Luminous lip balm that changes color to create your perfect pout. This stuff reacts to your skin's pH to find your most flattering shade of pink. Plus, it smells like coconut. Get it from Winky Lux, Nordstrom, or Urban Outfitters for $14. 31. Stud earrings to illuminate your lobes. 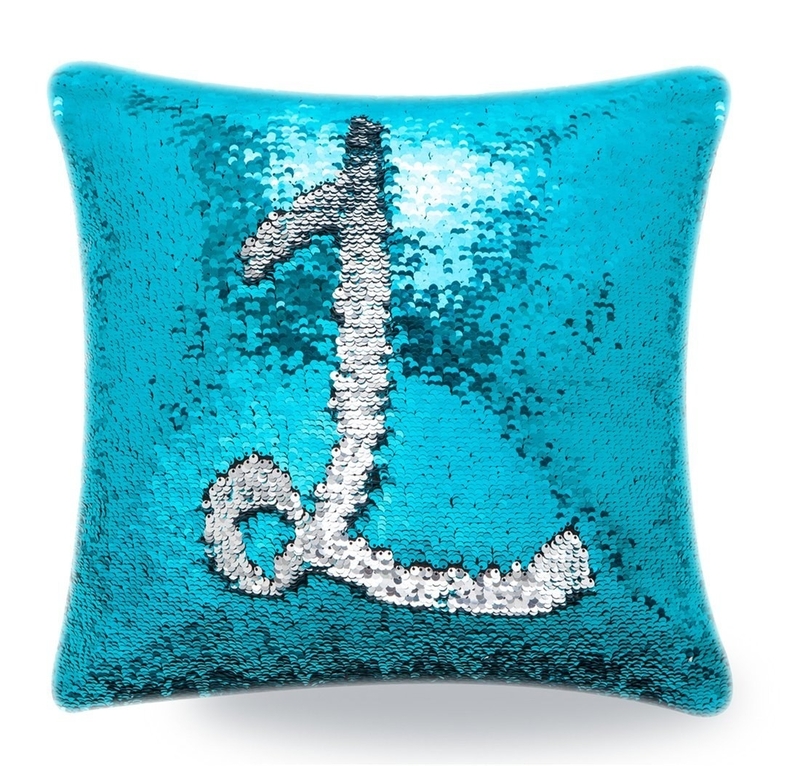 While it looks like they're filled with sequins, they're actually inlaid with glitter fabric. Get them from oneartsymomma on Etsy for $6+ (available in two diameters and two colors). 32. A pouf chair straight out of a magical fairytale castle. The sequins on this luxe lounge are reversible, so it can go from gold to silver or be a mix of both. It's extra in the best way. Get it from Urban Outfitters for $198. 33. A resplendently rock-and-roll top that's sheer perfection. Get it from Forever 21 for $12.90 (available in sizes 1X-3X). 34. Rainbow pencils because old-school number two pencils are a snooze, tbh. Get them from MightyPaperShop on Etsy for $3.06/each or $7.96 for a set of three. 35. A gleaming cat-ear headband for kaleidoscopic kittens. 36. 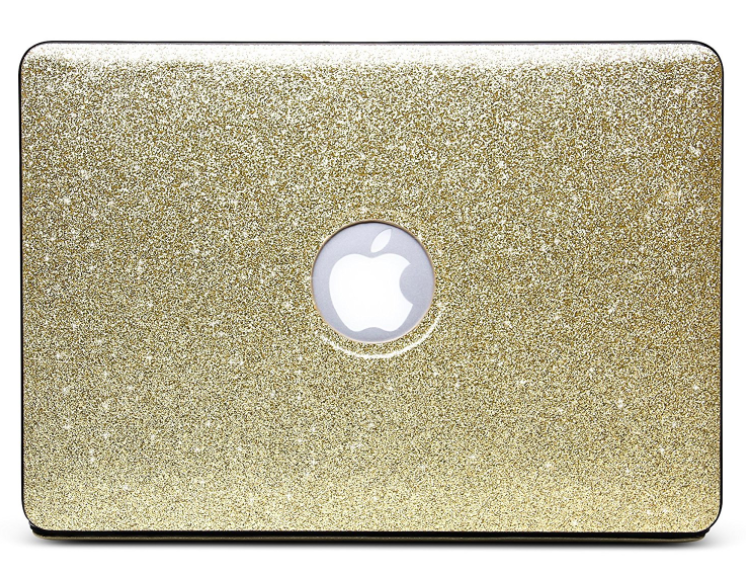 A twinkling laptop case to light up your desk. The case is made of a layer of faux leather over protective plastic, so don't let the ritzy exterior fool you — it's still super tough. Plus, it comes with a matching keyboard cover and a screen protector. Get it from Amazon for $16.99+ (available in 34 styles). 37. A cheeky choker set for adding a shot of shine to any look. Get a set of two from Missguided for $11. 38. Fab and fuzzy slippers, because you deserve to feel like a queen even if you're chilling in your twin-size bed. Get them from Express for $19.95. 39. Sailor Moon pins that shine brighter than la luna. Get a set of two from TriangleOfBears on Etsy for $7.15. 40. And finally, glitter glue for the most coruscating crafts you'll ever make. Get it from Amazon for $2.92+ (available in 10 colors).